There is something so enduring and romantic about getting married at the beach! 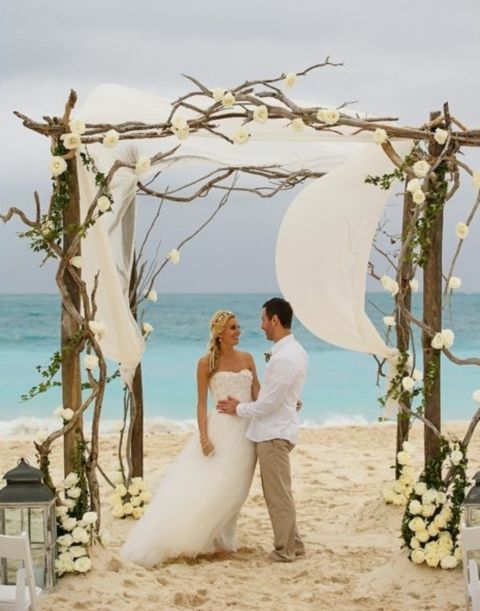 Beach weddings remain one of the most popular types of celebrations. 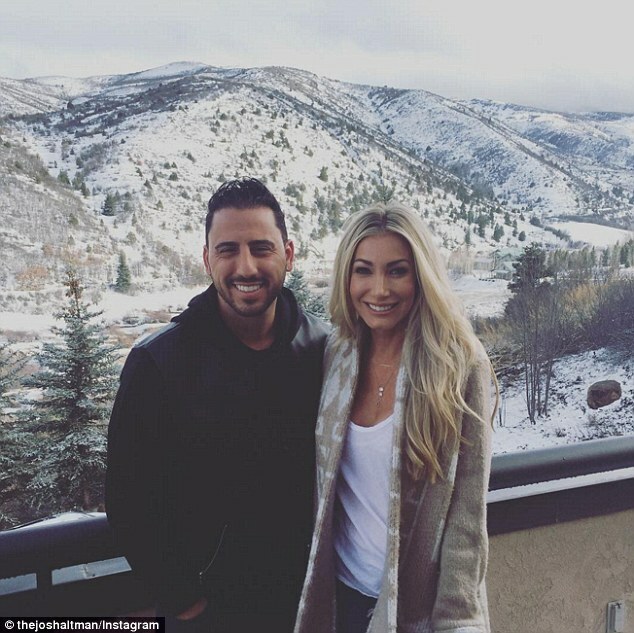 Couples can opt to keep things super casual and low key, joining with family and friends in a relaxed and informal day, or they can opt for a more formal affair with elegant touches including a tent and a sit down meal at another location. 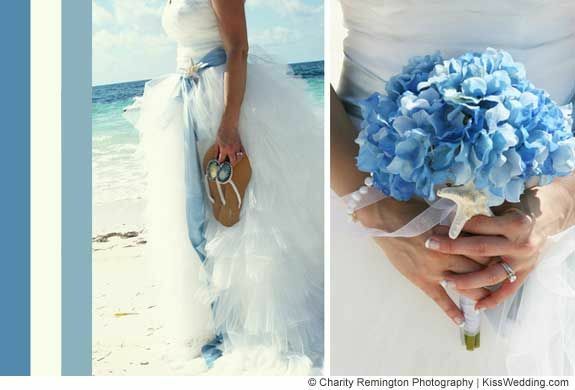 Beach wedding flowers can be vibrant and fun, or pale and elegant depending on the overall goal and theme of the event. You can even use sand and seashells to fill inexpensive glass vases for your beach themed centerpieces. Order beautiful bulk flowers to fill the vases. Two of the most iconic color schemes for beach weddings are blue and white, which gives a more nautical, crisp air, or tan and white, which evokes images of sand and bright sun. 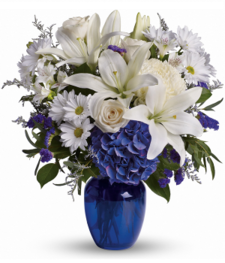 Try beautiful blue centerpieces and bouquets from BunchesDirect, such as Classic Blue Hydrangea bouquets, Heavenly Mist bouquets, or Blue Hydrangea Centerpieces. All white flowers are another perfect choice for this theme. Your flowers and accents will work well in this color scheme for your beautiful beach wedding, especially if you want a bit more of a traditional or elegant tone. 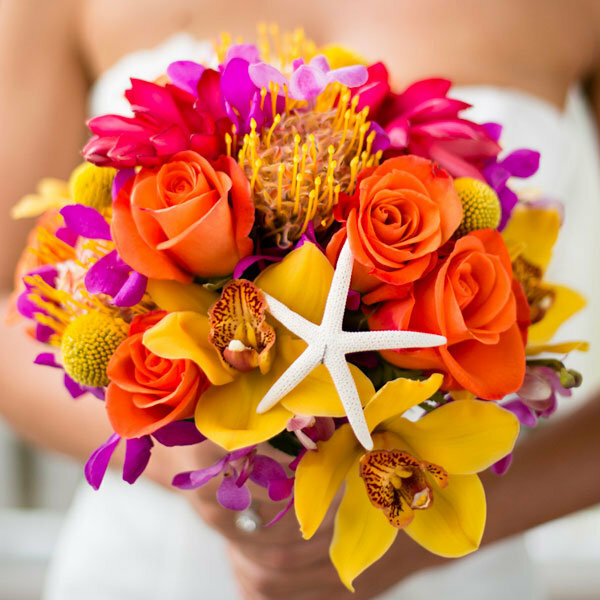 Another popular color choice for beach wedding flowers is high contract, such as orange, yellow, green or fuschia. These hues evoke tropical or Caribbean vibe to your celebration and keep things a bit more vibrant and relaxed. 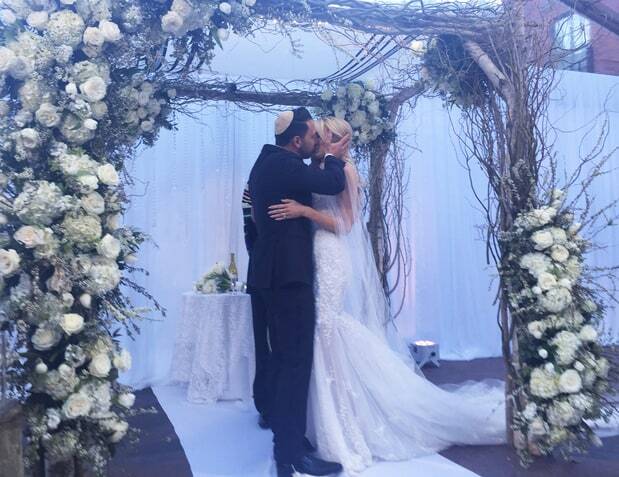 Building a wedding arch or even a small canopy of some kind helps set apart the place for your vows during the ceremony. This clever construction evokes the idea of driftwood. Use beautiful fresh bulk flowers to decorate your arch and give it that special touch. Try white roses (sold by the stem or by the box at BunchesDirect), or white carnations if you love what’s shown! 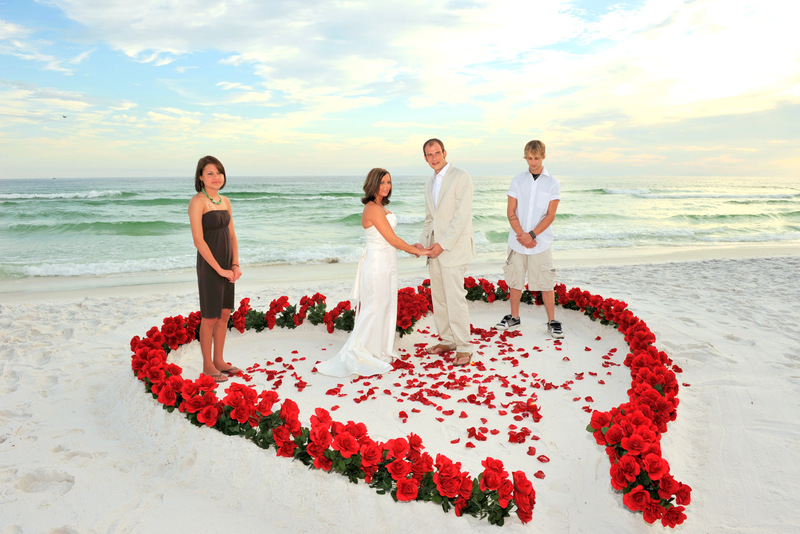 Another amazing idea for your beach wedding flowers is to order beautiful bulk flowers and create a heart on the beach to surround the wedding vows. A high contrast color like red will work nicely and lend an added touch of romance. Try red roses, red ranunculus, or red gerbera daisies. You could even do this using bulk red rose petals! 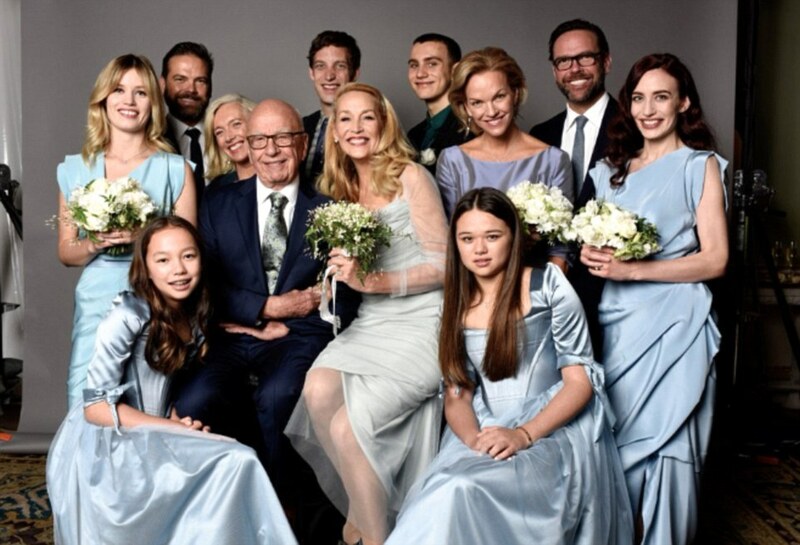 Planning a big party, wedding or celebration? If your event involves dinner, cocktail snacks or other entertainment that includes guests seated at tables, then sorting out what to put on the tables will be one of your key decisions. The guest tables are an important focus for your decorating and depending on your plans, guests might be spending much of their time here. Adding fresh flowers is one of the best ways to enhance the overall look of your venue and boost your guest experience. We’ve gathered some “go to” ideas for event centerpieces that are easy as well as beautiful, especially if you are putting them together yourself. Wondrous White: White or cream roses will always look elegant and lovely. They suit any theme or level of formality, coordinate with any other color, are timeless and always in style, and will be a graceful addition to any guest table. Order bulk white or cream roses and you will have the makings of a stunning centerpiece with almost zero effort! 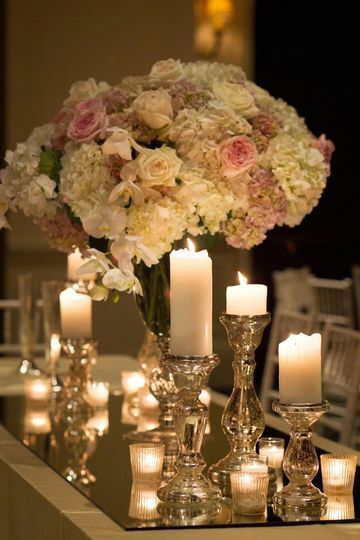 Pair white roses with small white tealights for added beauty and a simple solution to your centerpiece needs. Rich and Bold: This stunning mix of blooms makes for easy but gorgeous centerpieces. Order hot pink roses. dark pink or red alstroemeria (also known as peruvian lilies) and burgundy dahlias. The mix will create a lush and eye-popping combo that will set your guest tables apart. All available in bulk through online ordering at BunchesDirect, and our floral consultants can guide you into how many stems you will need. Cheery and Charming: Gerbera daisies, whatever their color, are an easy way to add instant charm to your guest tables. They are affordable, beautiful and come in a wide range of colors to suit any theme or decor. This centerpiece is prepared by BunchesDirect and comes ready to trim to fit whatever container you are using. Check the website for a whole host of beautiful, ready-to-go centerpieces for any event and budget! You can also order gerbera daisies in bulk and create your own easy event centerpieces. Beautiful Baby’s Breath. It doesn’t get much easier than this! Baby’s breath (or gypsophilia) is a delicate, airy and beautiful flower that makes wonderful centerpieces for a whole variety of events from baby showers, to weddings, to anniversary parties. 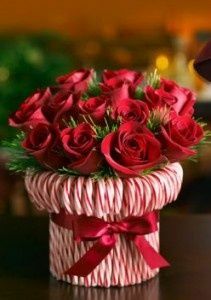 Buy bulk baby’s breath and arrange in a square container like this one, wrapped in inexpensive burlap and lace and you will have a lovely centerpiece. Fabulous Fruit. Simply add some fresh fruit slices, such as oranges, limes or lemons, to a clear glass vase and top with your favorite bloom and presto— instant beauty for your tables! This cheery and easy centrepiece features gorgeous fresh tulips which contrast beautifully with the orange slices. This would be perfect for a brunch, baby shower, weddings, Easter celebrations or any other party where bright cheer is a must. 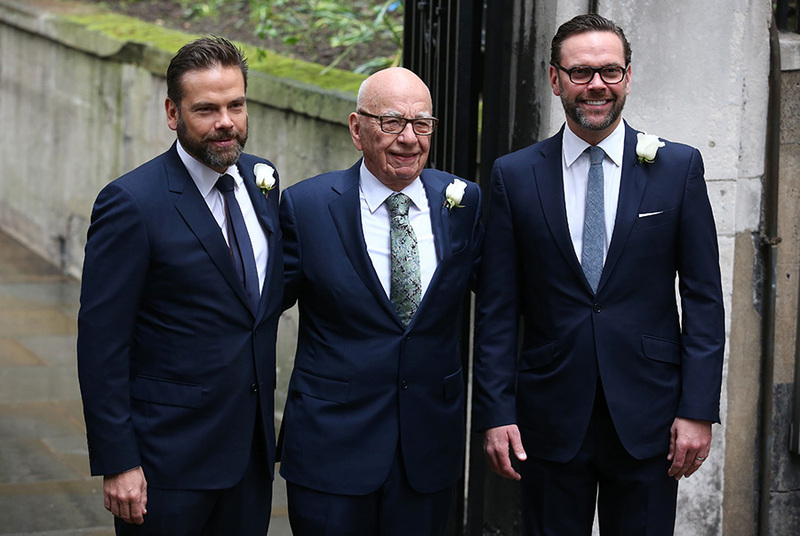 If you are planning a wedding, an anniversary or perhaps a very special event to celebrate love, your flower choices can really help boost the romance of your event! We’ve gathered a few of the best tips for making sure that the flower designs you choose provide a beautiful dreamlike aspect to your decor and reinforce the love that is in the air. What better way to create an air of romance that to spell out LOVE! 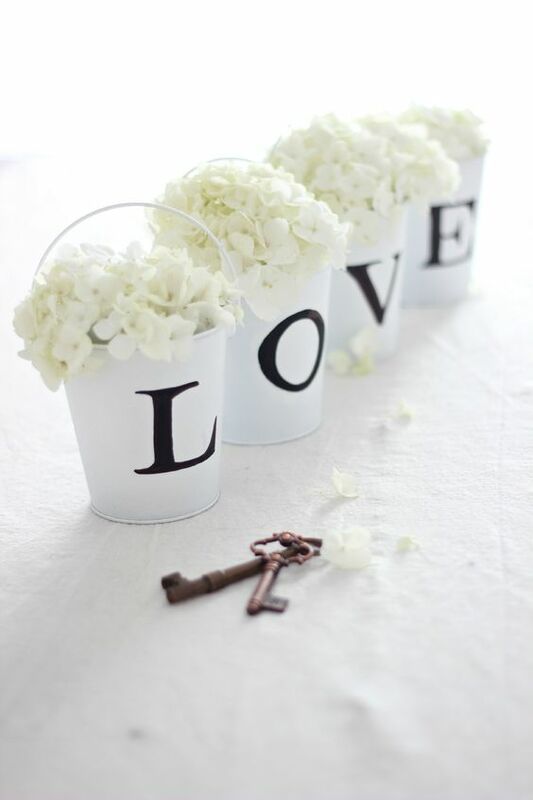 Use simple tin pails and a stencil kit from your craft store to create these sweet containers for your flowers. Choose old fashioned beauties such as these white hydrangeas to complement the look. Add some romance with special touches to embellish your floral displays. 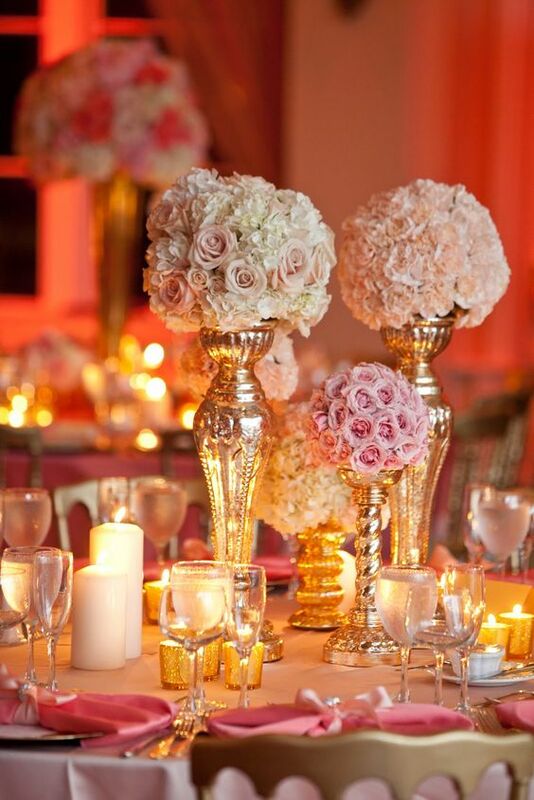 Try adding pearls, mercury glass vases, or touches of gold or silver to give your tables a gorgeous old world charm. You could also add some “bling” and sparkle using glass beads, rhinestones or faux diamonds and gluing them to your vases. Candlelight is always super romantic! Be sure to include lots of candles of all sizes in your decorating plans. Placing mirrors under your centrepieces will boost the romantic atmosphere even more as the candlelight is reflected and adds a beautiful ambiance to your venue. Create some tall arrangements that are full and lush and this will help get romance flowing. Believe it or not this is not an impossible DIY task! Check out this helpful BunchesDirect video for tips on how to make your own tall arrangements for either church or reception! 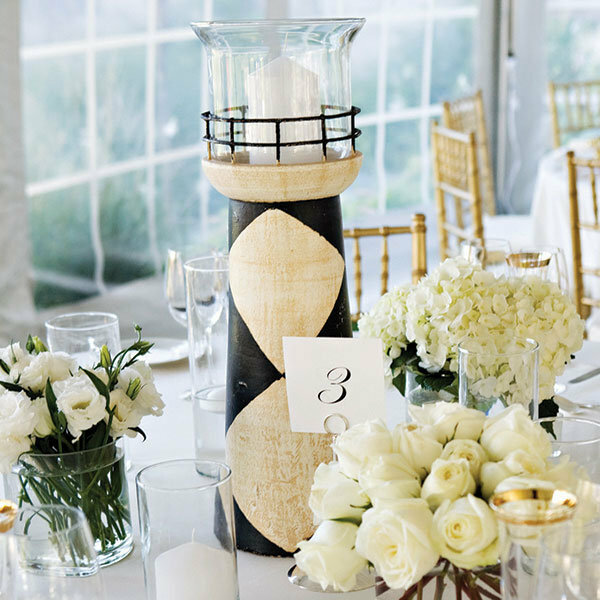 Try vases of clear glass, china, containers that are tall and elegantly footed, or traditional urn-shaped containers to add some romantic charm to your tables and venue. Another fantastic idea is to place floral pomanders (also called kissing balls) on top of shapely candlesticks. Click to read more about making your own pomanders. Just about any color palette can be used to create romantic ambiance. Try red for a more passionate and dramatic look, or go with soft old world shades of pink, peach, cream and white. 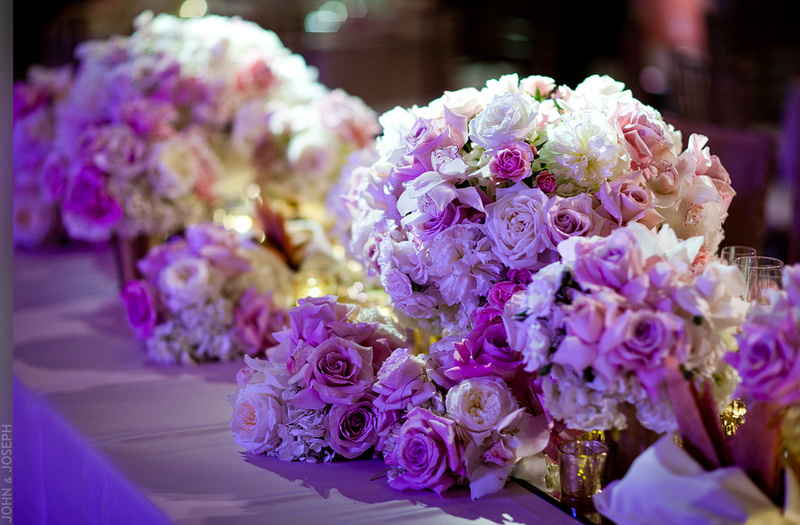 Purple can also be used very effectively in romantic flower designs. Selecting more traditional varieties of blooms such roses, ranunculus, peonies, dahlias, sweet peas, roses, or hydrangeas will add to the old world atmosphere of love and romance. Follow some of the above tips when choosing your bridal bouquet designs as well. Keep flower choice, color palette and general “lushness” in mind to coordinate your bouquets with your romantic look.